Forging, or overreaching, is a bad habit, and a horse with this fault is not very valuable. “Clack forging” is meant by the habit of clacking the hind and for shoes together. This kind of forging is not serious or harmful; it will only tend to wear off the toe of the hind foot and annoy the driver, possibly fatiguing the horse a little. The position of the foot at the time of the clack is different from what it is supposed to be. The toe of the hind foot is generally worn off while no mark is made on the fore foot. From this we understand that the hind foot never touches the heel of the front foot, but the shoe. Just at the moment the fore foot is raised up enough on the heel to give room for the hind foot to wedge in under it, the hind foot comes flying under the front foot, and strikes the web of the shoe. This is the reason no mark is found on the front foot, while the hind foot is badly worn off. Overreaching can be overcome by shoeing, but the shoer must know what overreaching is. Overreaching is simply this: the horse breaks over with the hind feet quicker than he does with the front feet. In other words, he has more action in the hind than he has in the front feet, and the result is that the hind feet strike the front feet before the latter can get out of the way, often cutting the quarters badly, and giving rise to quarter cracks and horny patches over the heels. Overreaching means that the hind feet are crowding the front feet, and the remedy is: increase action in the front, retard action in the hind feet. There are many different ideas about the remedy for this fault, and I am going to explain some of them in order that the reader may judge for himself which method is the best. One method is to shoe heavy forward and light behind. This is not exactly a bad idea, but it is not heroic enough to help except in light and sensitive cases. Another method is to shoe with sideweight shoes on the hind feet; the weight of course to be on the outer side of the shoe. This is not a bad idea, and will, in many cases, help but it should be remembered that sideweights do not affect the gait except in a swift trot. 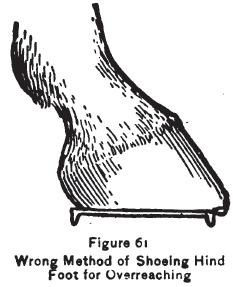 Toe weights on the fore feet is another method, but this way of shoeing is not of much value. This remedy must be such that it will increase action in front and retard action behind. Toe weights will not accomplish this. 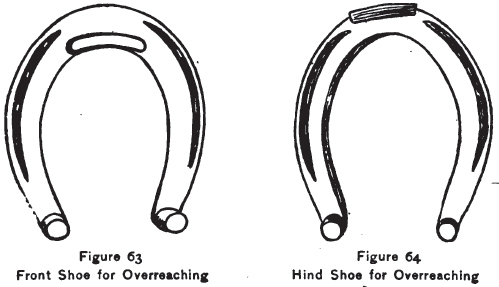 The most culpable practice is that of shoeing with short-heeled shoes in front, and setting the hind shoes well under the foot, letting the toe stick out over the shoe on the hind feet. This is the idea of a remedy that strikes the mind of the average horseshoer first. It is the easiest way to get rid of the case, but the fault is aggravated, not cured. (See Fig. 61.) So high an authority as A. A. Holcomb, D.V.S., in the work, Diseases of the Horse, published by the Agricultural Department, at Washington, has recommended this absurd method, totally unproductive of any good. The shoe should never be set back under the toes of the hind feet. 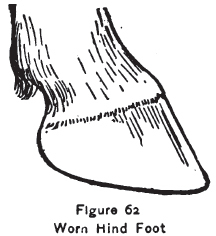 It will in most cases be found that the hind feet of overreaching horses are shorter from the coronet to the toe than the front feet, and have been stubbed off, as shown in Fig. 62. The only way to stop overreaching is to make the find foot longer than the front foot, the toe, or breaking-over point, being set forward not under the center of the foot, as is done by the incorrect method just mentioned. 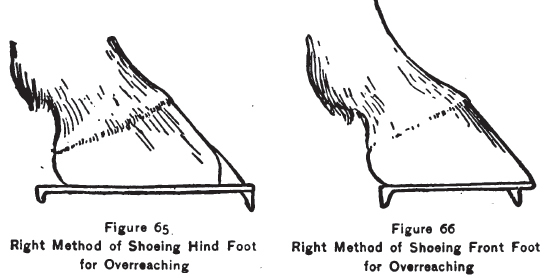 The hind foot being shorter and the breaking-over point nearer the center of the foot the hind foot breaks over quicker than the front foot, and the result is overreaching. To remedy this we must find a way by which we can lengthen the toe of the hind foot and shorten the toe of the front foot. The front foot should be leveled, the wall pared down as much as it will stand and the toe shortened. This done, make a shoe as shown in Fig. 63. The shoe should also stick out behind; the idea being to shoe with a long shoe and set the breaking-over point forward. The result of this is a slow action in the hind foot, and this accomplished, the fault is remedied. This method is a sure cure for overreaching, if the idea is properly carried out.